Obviously you can follow most healthy eating plans without the aid of any kitchen appliances (aside from a kettle, an oven and possibly a microwave) but there are some which make life quite a bit easier. 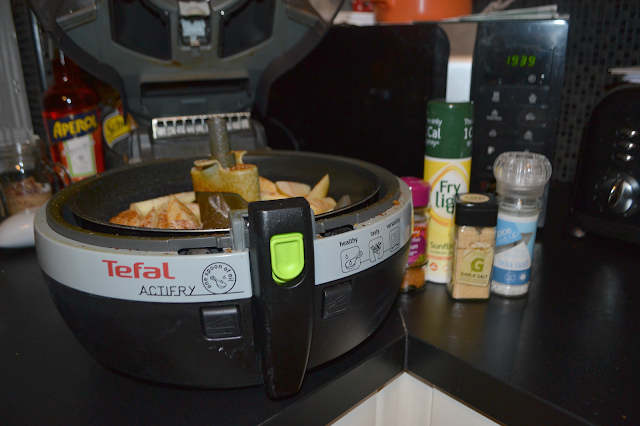 You've probably already heard of the Tefal Actifry, I've had mine for 3 years and I've made countless batches of Slimming World chips in it because it saves so much messing around. Without an Actifry, Slimming World chips involve par-boiling then oven baking and turning and I still don't think they turn out as good. Obviously chips aren't the only thing you can cook in an Actifry but that's the main thing I use it for. It's so easy, you just cut your potatoes in to chip strips (I always leave the skin on because I'm extra lazy), spray them with Frylight, add whatever seasoning you like (in my case this time it was salt and cajun seasoning) and then set them to cook for around 35 mins for a full load. The Actifry turns them periodically and cooks them to perfection, I don't even know what it does to them but it's bloomin' good. The timer tells you when the time is up and you just serve them straight from the bowl. The Tefal OptiGrill uses sensors to identify the thickness of the meat and adjusts the cooking time accordingly. There are 6 different meat settings (burgers, poultry, bacon, sausages, red meats and bacon) as well as a setting for frozen foods and a manual temperature setting. To begin cooking you just select your desired setting, leave it to pre-heat then add your product, close the plates and leave it too cook how you like it. It identifies and adapts to the thickness of whatever you put between the plates and cooks it to perfection. 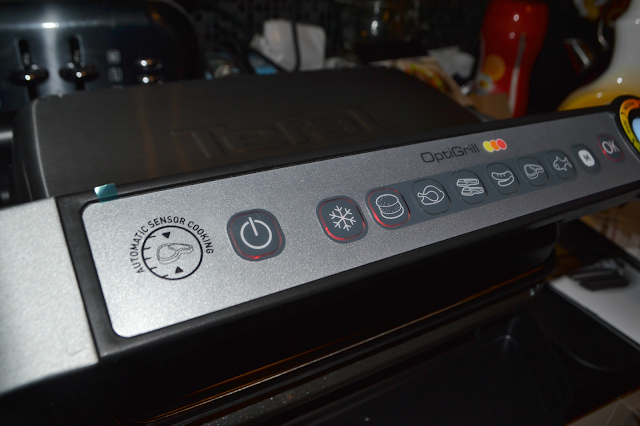 At each stage the OptiGrill tells you that it's complete and the indicator light changes colour accordingly. 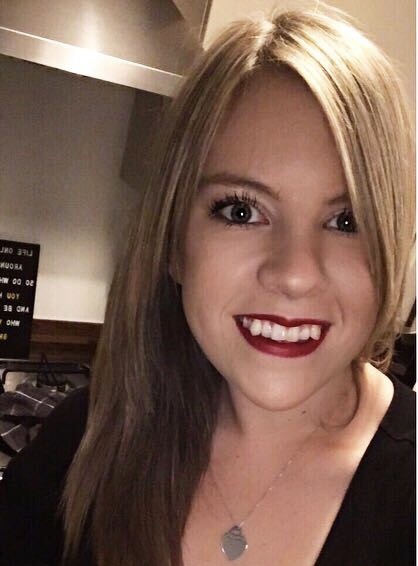 I'm so impressed by the whole thing and how easy it is; just being able to pop stuff in there and taking it out when it's cooked perfectly suits me down to the ground. I've managed to ruin so much food by over cooking it and not turning it when it's under the normal grill but this cooks everything evenly on both sides and leaves all the flavour in there. 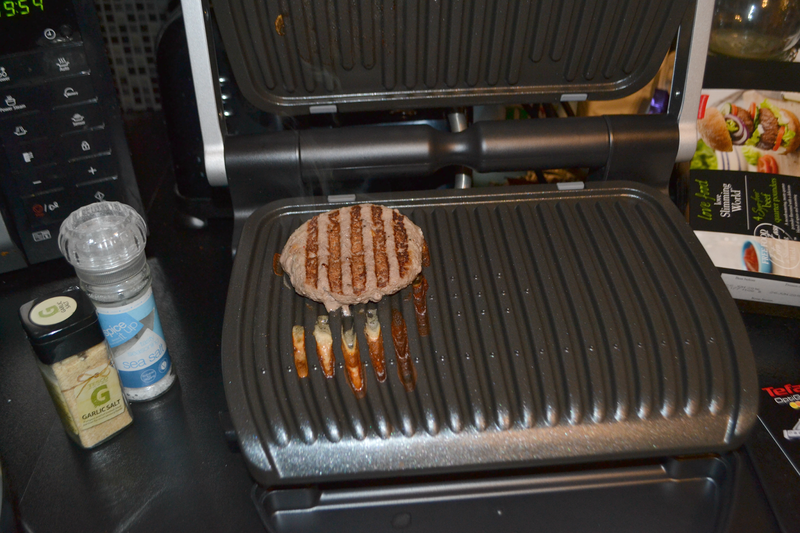 The fat drains into the drip tray at the bottom (although in SW Burgers case, there's very little fat). I thought that frozen burgers would be a test of how well this cooked things as it's so easy to char frozen foods whilst leaving the middle still cold. To set it going on the appropriate setting I pressed the 'frozen' button then the 'burger' button and then pressed 'OK', after the pre-heating stage it was good to go and after trusting it to cook the burger to 'medium' without looking at it once I lifted the top plate to reveal a perfectly cooked through burger which was juicy and flavoursome. I didn't add any oil or even Frylight as the plates are non-stick and the burgers didn't show any signs of sticking at all. The best thing about this is that if you can't fit everything on one cooking you don't have to wait for it to cool completely and reheat you just set it to pre-heat again (which doesn't take long at all) and do the cycle once more (one cycle of cooking should be enough for between 2 and 4 people depending on portion size). I was a little concerned about the cleaning process as I remember that my old George Foreman didn't come apart very well to allow for it but this is the total opposite; the plates unclip easily and can be washed in a dishwasher or manually as long as you don't use abrasive scrubbers. I'm so impressed with this gadget and I would honestly recommend it to anyone regardless of whether you're healthy eating or not because it's just so easy to use and it produces such tasty meat! It retails at only £100 from Debenhams and I would say that it's well worth it, especially if you struggle to know when meat is cooked because this does all the hard work for you! Do you fancy either of these healthy eating gadgets?